Phnom Penh, where have all the Vietnamese ladies gone? FCC Phnom Penh. 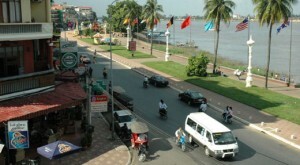 The View from the FCC Phnom Penh restaurant balcony, having breakfast while over looking Sisowath Quay Rd and the river side. Great way to start your day.